What is the DAY Function? 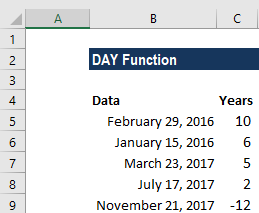 The DAY Function is categorized under Date/Time FunctionFunctionsList of the most important Excel functions for financial analysts. This cheat sheet covers 100s of functions that are critical to know as an Excel analyst. In financial modelingWhat is Financial ModelingFinancial modeling is performed in Excel to forecast a company's financial performance. Overview of what is financial modeling, how & why to build a model. A 3 statement model links income statement, balance sheet, and cash flow statement. More advanced types of financial models are built for valuation, plannnig, and, we often need to analyze time series data such as revenue. For example, in a restaurant business, we would be interested in knowing which day of the week is the busiest or find out if there is a trend emerging. For a fashion boutique, we would like to see which day of the month with the most number of customers coming in. We would be interested in knowing which days when most purchase orders are placed or shipments are done. The DAY Function is useful for financial analysts as it returns the day of a date, represented by a serial number. The day is given as an integer ranging from 1 to 31. 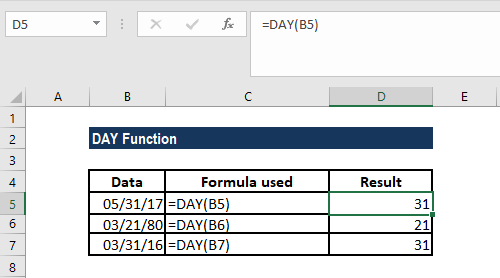 How to use the DAY Function in Excel? Suppose we are given the following dates, let’s see how the function returns a result. 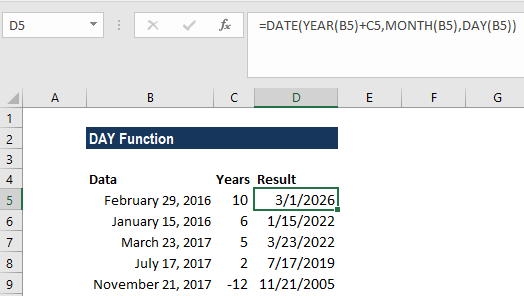 We provided the dates are supplied as references to cells containing dates or (in the example in cell A2) as a date returned from another Excel function. 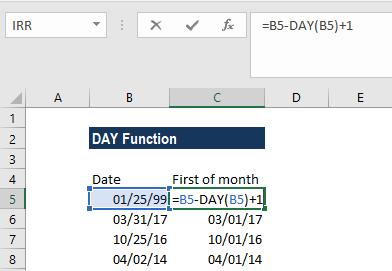 The DATE function helps in reassembling the component values back into a valid Excel date. In order to add years or to subtract years from the given date, we just need to add the value in B2 to the year component prior to the reassembly, so the formula we used is: =DATE(YEAR(A2)+B2,MONTH(A2),DAY(A2)). Suppose we wish to get the first day of the month for a given date. For this, we can form and use a simple formula based on the DAY function. Let’s now understand how this function works. 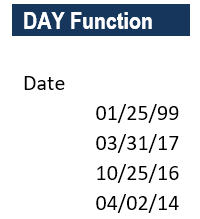 Here, when we used the DAY function, it would return the day value for a date. As shown in the example, the day value for the date in cell A2 (January 25, 1999) is 25. Remember that dates are stored in Excel as serial numbers. 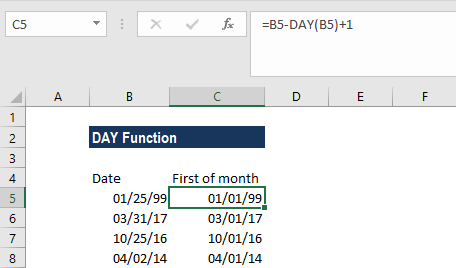 As the dates are just serial numbers in Excel, we can subtract 25 and then add 1 to get the date value for January 1, 1999.